The Bornacoola G.A.A. 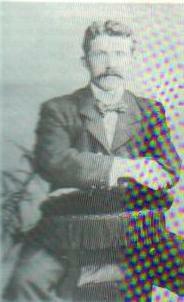 Club was founded in Janurary 1889 by J.J. Kellegher N.T., at Johnstons Bridge in the parish. At this time the team was known as the Bornacoola Hugh O'Neills. The first recorded match in which Bornacoola took part occurred on April 1st 1889 against Rooskey Pat Molloys although no result from the game is available. Although, it is reported that the Bornacoola team arrived in Rooskey with about 300 supporters! J.J. Kellegher N.T. - Founder of Bornacoola Hugh O'Neills Club. 1904 and 1905 County Final Wins. Bornacoola won the county finals in both 1904 and 1905 but due to objections concerning one of the players did not recieve the cup on either occasion. Packie McGuinness was the player objected to on both occasions, on the grounds that he played for Clonguish in the Longford Championship. Although there are no records upholding this accusation, it is known that McGuinness did play some tournement games for Clonguish, where he was employed as a National School teacher at the time. The 1906 championship ended for Bornacoola in February 1908! when they were drawn against Gorvagh in the semi-final. However Bornacoola failed to turn up and no reason can be found in any of the reports at the time. There were no 1907, 1908 or 1909 championships held in Leitrim due to the protracted playing of the 1906 championship, with it's constant objections and squabbles. During the 1910 to 1919 era Bornacoola failed to field a team representing the whole parish. Johnston's Bridge and Cloonturk fielded teams at different times but neither had any success. The twenties was the only time Bornacoola did not have a team, and although the 'Black and Tans' and the subsequent Civil War militated against organised games, it would still appear that Bornacoola simply did not have enough players of sufficient calibre to make a viable team. Players from the Rooskey and Cloonmorris areas played with Rooskey or Clonguish and those in the Dromod area tended to gravitate towards Annaduff, Mohill and Eslin. However, Bornacoola did share in the Leitrim Connaught success of 1927, with the presence on that team of the 'Nipper' Shanley, who played with Annaduff at the time. The 1930's saw the revival of the Bornacoola G.A.A. Club, when a meeting was held at Johnston's Bridge. It was decided to enter a team in the 1931 Junior Championship, which Bornacoola won, beating Tully 1-4 to 1-3 in the final. However an objection by Tully was upheld, and Bornacoola once again lost a title in the boardroom. 1932 saw Bornacoola crowned Junior Champions beating Glenfarne in the final. In the years 1933 to 1937, Bornacoola played Senior football, but no titles were won. However it is worth noting that 1937 ended in controversy for Bornacoola. A match played against Cloone ended in uproar whan a Cloone supporter blatantly kicked back into play a ball that was going wide at the Bornacoola end line allowing Cloone to score a goal. This left the final score at Cloone 3-2, Bornacoola 2-3. The County Board upheld the result, and Bornacoola were incensed, withdrawing from the County Championship. The Bornacoola players on the Leitrim team selected to play Mayo in the Connaught Championship also refused to play. This would have included: John F McGuinness, Tom Aherne, Gerry Shanley, Mick McGowan, 'Nipper' Shanley and Micky Donlon. Bornacoola Team and Supporters circa 1938. 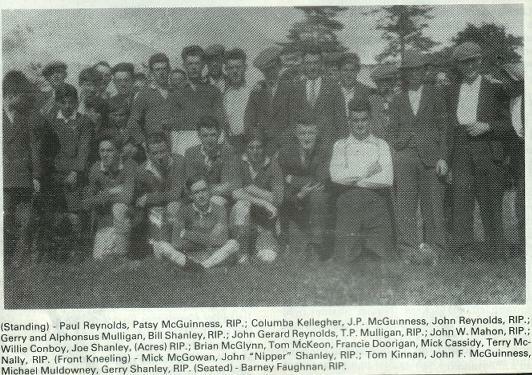 1938 was an historic year for Bornacoola as they were crowned Senior Champions, beating Tully in the final. The team that represented Bornacoola in the final was: Seamie Mulligan, Willie Molloy, J.F.McGuinness, Willie Conboy, Willie Mulligan, John Ger. Reynolds, Tom Aherne, Micky Donlon, Gerry Shanley, Frank Diffley, John 'Nipper' Shanley, Tomas (Junior) Reilly, Packie Kerrigan, Jack Conboy, Mick McGowan. Subs: Johnny Donlon and Willie Molloy (Cloonturk). 1939 was an anti-climax after the glory of 1938. At the County Convention Bornacoola had a request to play in the Longford Champioship heavily defeated. On the field, a first round defeat in the championship at the hands of neighbours Annaduff ended the decade on a low note. The acquisation of John F. Connor and Willie McNamera from Annaduff, served to further strengthen Bornacoola. However, success alluded until 1943 when, aided by the demise of the Gortletteragh Senior Team (which brought us a number of excellant players), Bornacoola won both the Senior Championship (Bornacoola 3-9, Fenagh 1-4), and the League (Bornacoola 2-4, Aughawillan 0-3). In 1944 Bornacoola returned to the old series of a bad year following a good year and, in 1945 Bornacoola regraded to Junior football, winning the Junior Championship of that year by beating Gorvagh in the final 2-3 to 0-2. 1946 and 1947 were fairly non-eventful for Bornacoola on the football field, the only game of note was a defeat in the Junior League Final of 1947 at the hands of Fenagh. In 1948, the Junior Team again finished without honours. However, the Bornacoola Minors brought home our first ever Minor Championship title, (and our last, until 1996 when the Minor B Championship was won by Bornacoola!). The team of 1948 was: Jimmy Dennigan, Brendan Stenson, Gerry Diffley, Jim Nesbitt, Charlie Devine, Frank Flynn, John Tom McGushin, Jim Faughnan, Ciaran Shanley, Michael J. McGarry, Gene Cox, Vincie Faughnan, Bernie Mahon, Mel Cox and P.J. Healy. 1948 was also the year of the St. Mel's All-Ireland victory and Bornacoola was proud of the contribution of their minors to this victory - Jim Faughnan, Gene and Mel Cox. 1949 was rather depressing for the Junior team, although there was a feeling that the growing maturity of the minors would soon lift the club back to Senior football. The decade therefore ended on a note of hope, which was to be fulfilled, as the decade that followed proved to be the club's most successful yet. The 50's started off in triumphant form for Bornacoola, winning the Junior Championship (Bornacoola 1-7, Glenfarne 1-3), and the League (Bornacoola 6-3, Aughawillan 0-3). The Minors however were not as lucky, and although they reached the final, they were defeated by Fenagh (2-7 to 1-5). A move to Senior football in 1951 payed no dividends, and so it was back to Junior football for 1952, where Bornacoola promptly won the Championship, defeating Aughawillan 3-4 to 3-3. In 1953, Bornacoola were back playing Senior football and won the Championship, defeating Aughavas by one point in the final (1-6 to 1-5). 1954 saw no reward for Bornacoola's efforts, going out to Mohill in the semi-final of the Championship and finishing runners-up in the League. 1955 was another year dogged by controversary. Bornacoola won the Championship, beating Sean Tracy's. However, in the meantime, Aughavas who had won their first round match, but lost it following an objection, had appealed this decision to the Connaught Council, and were reinstated. By now the Championship was over, but the Leitrim Co. Board ordered Bornacoola to play Aughavas in a new County Final. Bornacoola refused and the Co. Board awarded the title to Aughavas. The League was abandoned this year also, leaving Bornacoola without a title once again. In 1956, fortunes were reversed when Bornacoola were crowned League Champions after defeating Aughavas. However, Bornacoola lost out to Ballinmore in the Championship in the South Leitrim Final. 1957 was a great year for the club, as Bornacoola took the double, beating Melvin Gaels 3-7 to 0-5 in the Championship Final, and overcoming Aughavas in the League Final. This is the last time Bornacoola have won a Senior title, but hopefully this will be rectified in the forseeable future!! The 1957 winning team was: Packie Greene, Charlie Devine, Jack McNally, John T. McGushin, Gerry McGarry, Eddy Duffy, Tommy Shanley, Michael J. Beirne, Tony Hayden, Vincie Faughnan, Mick Hussey, Noel Hayden, Frank Donnelly, J.P. Newton, Stanley Cox. 1958 saw a number of changes at the club as Annaduff reorganised and Bornacoola lost a number of players to them. Ballinmore proved too strong in the first round of the Championship, and although the League Final was reached, Bornacoola were defeated by Melvin Gaels. 1959 saw another decline in fortunes as early defeats in the Championship and the League ensured Bornacoola out of the running for any titles. The sixties proved unfruitfull to Bornacoola, and after a number of demoralising defeats, and problems with numbers, the club ceased to exist in 1964. The last Senior Team to line out for Bornacoola was in the first round of the Championship against Melvin Gaels, the match being played on the newly opened Pairc Sean MacDiarmada. The team was as follows: Sean Farrell, Joe Daly, Tommy Shanley, John Tom McGushin, Gerry McGarry, Michael J. McGarry, Shay Reynolds, Liam Shanley, Noel Hayden, Charlie Shanley, Seamus Hayden, Michael Mallon, Jimmy Geelan, T.P. Shanley and Pascal Diffley. In 1968, following a well attended meeting in Cloonturk Hall on St. Patrick's Day, it was decided to reform the club and a Junior team was fielded in the 1969 League although no success was achieved. As success continued to allude the Junior Team during the 70's (in fact sometimes the club could not field a team), it was decided by mutual consent to discontinue the Junior Team, and to concentrate on the underage teams of the parish. This resulted in a parish Under 16 team in 1973 and a Minor team in 1974. Although there was no successes, this move boded well for the future and by 1976 the Junior Team was re-established and had won the League Title. The team was: Tomas Larkin, Gerry Hackett, Shay Reynolds, Sean Fallon, Henry Faughnan, Liam Mahon, Christy Farrell, Noel Mahon, Frankie Bohan, Ciaran Fallon, Gerry O'Connor, Gerry Beirne, Seamus Mulligan, Noel Hayden and Mick Quinn. 1977 and 1978 saw Bornacoola losing two Junior County Finals in succession, firstly to Drumreilly and then to Mohill. Following a few up and down years, Bornacoola won the Junior League in 1983, however this was to be the lone highlight for some time. 1986 saw the opening of the new Bornacoola grounds at Dromod, and the anticipation of a bright future. The Junior Championship of that year saw Bornacoola defeated by Annaduff in the semi-final, who went on to collect the silverware. The league campaign was devoid of highlights. 1987 saw a bad start to the league campaign, but a good recovery and respectable mid-table finish followed. A first round exit from the Championship after a replay with Eslin ensued. League and Championship highlights of the late 1980's were few and far between, however the most notable among them was the Junior semi-final saga of 1988 with Eslin, which lasted three games and a period of extra time before it was resolved. 1989 saw the re-inroduction of an Intermediate Championship and Bornacoola found themselves playing championship at that grade in the '89, '90, and '91 seasons, as it included teams in the bottom half of Division 2 and all teams in Division 3. In it's first year, 1989, Bornacoola again reached a championship semi-final. However opponents Ballinglera fell foul of the referee and on the infamous day of the thrice taken penalty (three times missed! ), the game was abandoned with ten minutes remaining. Bornacoola sportingly agreed to a replay but unfortunately Ballinglera took full advantage to qualify for the final. In the Division 3 League, promotion seemed within our grasp, needing just one point from the last two fixtures, but injuries took their toll in the run-in and both games were lost. 1990 was a mixed up year with an up and down league campaign which saw Bornacoola finish in fourth place. A defeat at the hands of Aughavas in the second round meant an early exit from the Championship. However a hint to the future was emerging as the Under 12 team reached the Rural Championship and Division 1 Special League Finals. The Junior League of 1991 saw Bornacoola qualify for the final, but defeat awaited once again at the hands of Eslin. However promotion to Senior League Football had been earned, although a restructuring of the leagues at County Convention decreed that Bornacoola would play in Intermediate League Division Two in 1992. In the championship following a good run Bornacoola were defeated by eventual champions Carrigallen in the semi-final. In 1992, following a slow start, a great run of results towards the end of the League ensured a by and large successful first season in Intermediate football. 1993 however proved to be a watershed year as results proved hard to come by and the season ended in relegation to Junior status. The Championship saw a semi-final defeat at the hands of Aughavas. 1994 proved more difficult than anticipated with injuries and retirements taking their toll, and with one league game remaining at the turn of the year Bornacoola faced relegation to Division 4. The Championship also proved unsuccessful with a first round defeat to Drumreilly. 1995, and the outstanding '94 game was won ensuring Bornacoola another year in Division 3. 1995 also saw the introduction of many of the 1994 Under 16 Dolan Cup and Division 1 League winners to adult football and the upward climb began. A League final place was gained but again Bornacoola suffered defeat, this time at the hands of Double winners, Kiltubrid. 1996 - 1998 From Junior to Senior in Two Years! 1996 saw our players mature greatly and promotion to Intermediate status was gained as Bornacoola finished top of the league. The league title was also won, defeating Aughawillan in the final. However, in the Championship, defeat by old hands Eslin saw Bornacoola depart at the semi-final stage. 1996 also proved a great year for the Bornacoola Minors, as they took the Minor B Championship and League. 1997 saw promotion well within Bornacoola's grasp. The final match of the season against St. Mary's proved memorable. Behind by seven points at the three-quarter stage and things looked bleak. However, an unforgettable last twelve minutes saw the Carrick men overturned, and promotion to Senior football was secured with a one point winning margin. Bornacoola's minors also retained their titles, winning the Minor B Championship and league titles for a second successive year. 1998 and for the first time since the 60's, Bornacoola were playing Senior football. However, games became irregular due to the Leitrim Minor's historic success, and the County Commitee decreed in early 1999 that the unfinished leagues would be abandoned, ensuring Bornacoola another year in the top flight. The Junior team were unlucky to be defeated by Cloone in the Division 3 Championship final. However the most significant victory for the club was the Minor A Championship, which was captured along with the Minor League title, the first time for the club since the 50's. This outstanding achievement created an all-time Leitrim record in winning 3 championship and league doubles in successive years and remaining unbeaten in the process! 1999 saw Bornacoola finish the League with with 6 wins but one point short of the required total. However County Convention has restructured the leagues and Bornacoola remain in Division One football. A good run in the Championship saw a semi-final place gained, but Fenagh proved too strong after a replay. The Junior team took the Junior B title and promotion to Division 3, while the Under 21's made it a Championship Double with a victory over Mohill, Bornacoola's first ever Under 21 title. 1999 was also historic with the fielding of a third team in Division 5 which reached the League and Championship semi-finals. THIS SECTION WILL BE UPDATED SHORTLY!